Host connectivity and scanning that are perfect for various specialty handheld scanning applications. The LS 2106 Hotshot is intuitive and easy to use. It offers features such as Flash memory, RSS decode capability and advanced data formatting. It has a large two-color LED and adjustable volume beeper provide positive feedback of successful scans. The protective molded casing absorbs impact and protects the scan window. Lastly, the LS 2106 Hotshot has an excellent scan range and can read 13mil codes from 0 to 17 inches. Its multiple interfaces provide connectivity to virtually any host. All units feature Symbol's 5 year warranty. Continuing the Symbol tradition of award-winning design, the LS 2106 Hotshot is comfortable and easy to use, even for extended time periods. Weighing less than 6 oz./168 gm, the LS 2106 Hotshot 's optimal handle size and soft-touch trigger minimize operator fatigue and boost productivity. Backed by the trusted Symbol name, LS 2106 Hotshot offers the same high quality and consistent reliability that users have relied on for over 25 years. 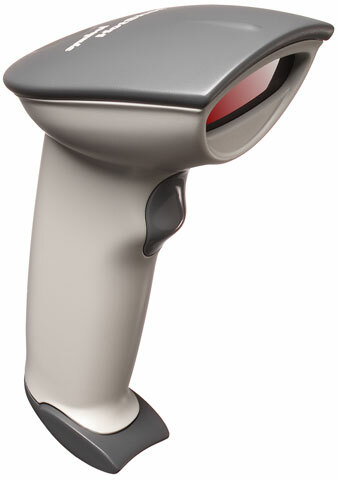 Available in decoded and undecoded versions, LS 2106 Hotshot offers impressive features to meet the requirements of specialty hand-held scanning applications. Detailed attention to the ergonomic "aim-and-shoot" design means it is intuitive to use and minimizes operator training. Its excellent scanning range and large "sweet spot" reads UPC/EAN barcodes from contact to 11 in./ 27.8 cm and 5 mil high-density barcodes from 0.5 in./1.3 cm to 2.5 in./6.4 cm. At the heart of the LS 2106 Hotshot is Symbol's acclaimed SE 1200 Series Scan Engine. Advanced barcode reading capability includes a variety of barcode sizes, even poorly printed and low-contrast symbols. Symbol's patented Mylar®scan element eliminates wear providing years of dependable performance, and uses less power, extending battery life in portable applications. In addition to the onboard RS-232 or Keyboard Wedge interfaces, Symbol's exclusive Synapse "Smart Cable" offers connectivity to virtually any host type by a simple cable change. LS 2106 Hotshot 's gold-coated optics increase first-pass read rates in a variety of lighting conditions. Protective elastometric rubber overmolds absorb impact, provide easy pickup and prevent the LS 2106 Hotshot from sliding off the counter, allowing for years of durable and reliable scanning service. An optional hands-free stand is available for fixed-mount scanning of smaller items, especially useful at the point-of-sale. Engineered to provide the top performance of any laser scanner in its class, the LS 2106 Hotshot is your best choice when you need a dependable scanner at an affordable price. The world leader in portable scanning solutions with millions of scanners and terminals installed worldwide, Symbol Technologies offers solid scanning solutions for all your business needs.